China's economy got off to a strong start in the first quarter, with GDP expanding at a higher-than-expected 6.9 percent year-on-year. The result has laid a solid foundation for the country to achieve its growth target of at least 6.5 percent this year. The first quarter data point to "resilient growth momentum", said Nomura Securities in a research note. The data herald strong beginning of the year for China, but also a positive contribution to regional growth and, due to the mainland's role as the second-largest economy in the world, to global growth prospects, according to Dan Steinbock, the founder of Difference Group and research director at the India, China and America Institute (USA). Based on the forecast-beating data, the International Monetary Fund (IMF) upgraded its forecast for China's economic growth in 2017 and 2018 to 6.6 and 6.2 percent, respectively, 0.1 and 0.2 percentage points higher than its forecast in January. The global growth forecast for 2017 was also raised by the IMF to 3.5 percent, up 0.1 percentage points from its January projection. "Given the stable growth, China can put greater emphasis on supply-side structural reform and prevention of financial risks," said Xu Hongcai, an economist at the China Center for International Economic Exchanges. "What the strong first quarter performance does make possible is a more decisive shift to fiscal and monetary tightening in the second half of the year, while keeping the current growth target intact. That's the real achievement of the Chinese economy in the first quarter," Steinbock wrote in a column on China Daily. China's GDP expanded at 6.9 percent year-on-year in the first quarter. The growth, marking the quickest pace since the last quarter of 2015, was 0.1 percentage point higher than the 6.8 percent in the fourth quarter of last year. A total of 77.2 percent of the first-quarter GDP was driven by consumption, 12.6 percentage points higher than the 2016 level. The service sector accounted for 56.5 percent of the overall economy, 17.8 percentage points higher than that of the secondary industry. 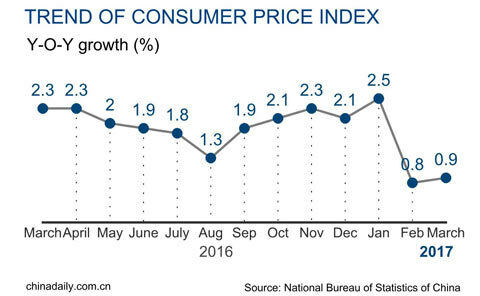 China's consumer price index rose 1.4 percent year-on-year in the first quarter, according to NBS data. In March, CPI grew 0.9 percent year-on-year. The pace, almost on par with market expectations, quickened from a growth of 0.8 percent in February. 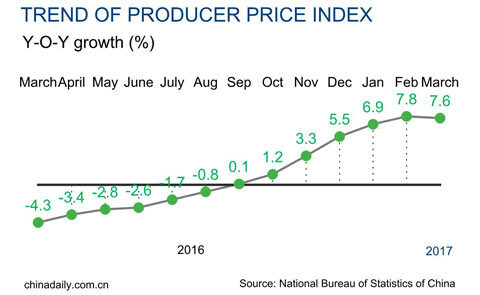 China's producer price index rose 7.4 percent year-on-year in the first quarter, according to NBS data. In March, PPI rose 7.6 percent year-on-year, slightly retreating from the 7.8 percent growth registered in February, which marked the highest since 2008. 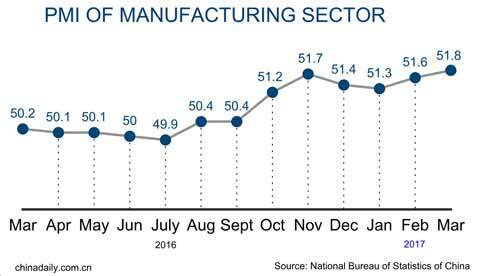 China's manufacturing purchasing managers' index came in at 51.8 in March, higher than the 51.6 recorded in February. The reading beat market expectations and was the highest in nearly five years. In April 2012 it reached 53.3. A PMI reading above 50 indicates expansion. 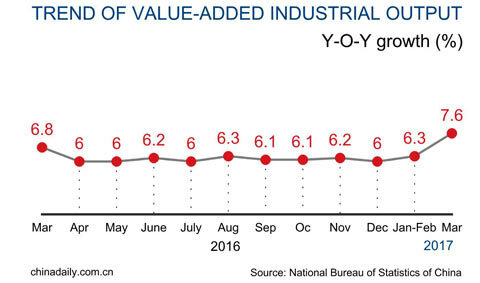 China's value-added industrial output expanded 6.8 percent year-on-year in the first quarter this year, compared with the 6.3-percent increase for Jan-Feb, according to the NBS. 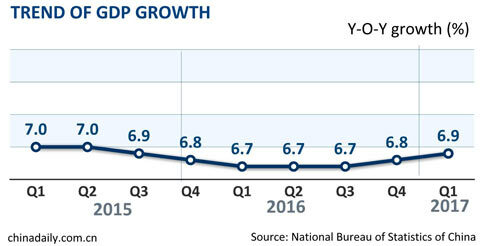 The 6.8-percent growth rose from the 5.8-percent increase in the same period of 2016. It was also higher than the 6-percent annual gain seen in 2016. In March, industrial output expanded 7.6 percent year-on-year. Fixed-asset investment growth rose to 9.2 percent for the quarter from 8.9 percent. 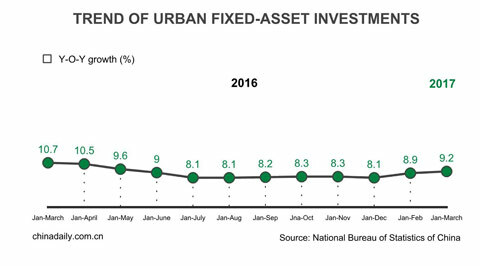 Private fixed-asset investment, which accounts for more than 60 percent of the total FAI, rose by 7.7 percent year-on-year in the quarter, compared with 6.7 percent in the first two months. In the agricultural sector, fixed-asset investment jumped the fastest, up 19.8 percent year-on-year. 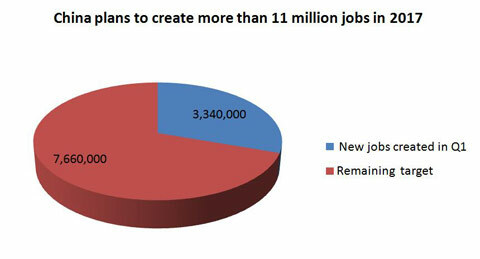 It was followed by 12.2 percent growth for the service sector and 4.2 percent growth for the industrial sector. 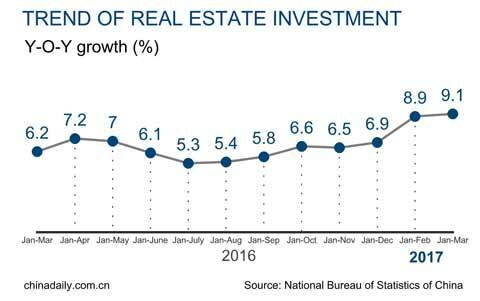 China's property investment rose by 9.1 percent year-on-year in the first quarter of the year, the fastest growth rate since March 2015. New construction starts measured by floor area were up 11.6 percent in the first three months of the year, comparing with a 10.4 percent rise in first two months. Property sales measured by floor area grew 19.5 percent in January-March from the same period a year earlier, down from 25.1 percent in the first two months of the year. Retail sales growth beat expectations, rising to 10 percent year-on-year in the first quarter, down by 0.4 percentage points compared with 2016 as a whole. Retail sales growth in March, however, rose to 10.9 percent, up from 9.5 percent in the first two months. 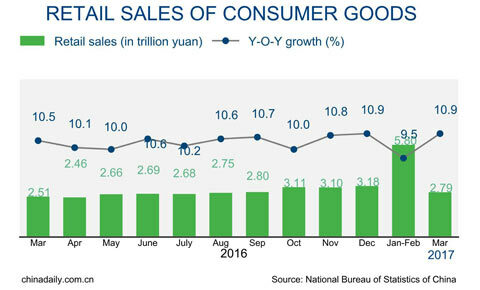 Retail sales of consumer goods totaled 8.5823 trillion yuan ($1.25 trillion) during the January-March period. Online sales continued strong growth, surging 32.1 percent in the first three months to 1,404.5 billion yuan. 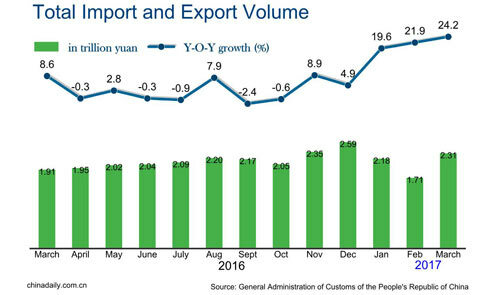 China's imports grew faster than exports in the first quarter, resulting in a 35.7-percent shrinking of trade surplus, customs data showed. Exports in yuan-denominated terms rose 14.8 percent year-on-year in the first quarter, while imports increased 31.1 percent. Foreign trade volume reached 6.2 trillion yuan ($902.47 billion) in the first quarter, up 21.8 percent year-on-year, with a surplus of 454.94 billion yuan. 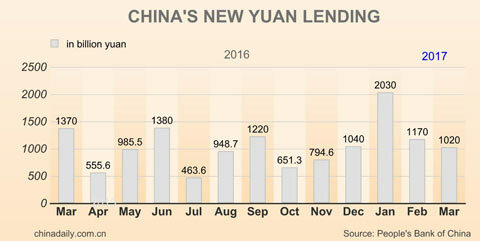 The volume in March came to 2.31 trillion yuan, up 24.2 percent year-on-year. China's banks extended 4.22 trillion yuan ($613 billion) in new yuan loans in the first quarter of 2017, central bank data showed. The year-on-year growth decelerated, though, from 4.61 trillion yuan loans added in the same period last year, according to the data. The M2, a broad measure of the money supply that covers cash in circulation and all deposits, grew 10.6 percent from a year earlier to about 159.96 trillion yuan by the end of March. The M1, a narrow measure of the money supply which covers cash in circulation plus demand deposits, rose 18.8 percent year-on-year to 48.88 trillion yuan by the end of last month. Foreign direct investment into the Chinese mainland edged up 1 percent year-on-year in the first three months to 226.5 billion yuan, the Ministry of Commerce said in a statement. During the same period, 6,383 new foreign-funded enterprises were established on the Chinese mainland, up 7.2 percent year-on-year. Most investment went to the service sector, which saw FDI expand 7.1 percent year-on-year in the first quarter to account for 73 percent of the total FDI. FDI rose 6.7 percent year-on-year to 87.8 billion yuan ($12.8 billion) in March. China's fiscal revenue rose 14.1 percent year-on-year to 4.44 trillion yuan ($645.9 billion) in the first quarter, the Ministry of Finance disclosed at a press conference. The growth slightly retreated from the 14.9-percent gain seen in the January-February period, but was still markedly above the 4.5-percent rate in 2016. 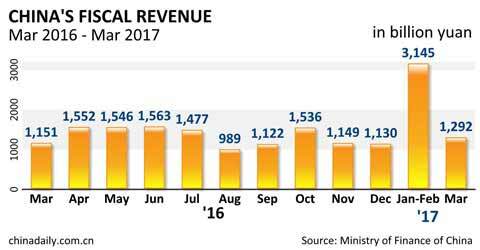 In March alone, fiscal revenue went up 12.2 percent to 1.29 trillion yuan. The ministry attributed the continued momentum to rising prices at the factory gate, a firming economy, and recovering exports and imports. 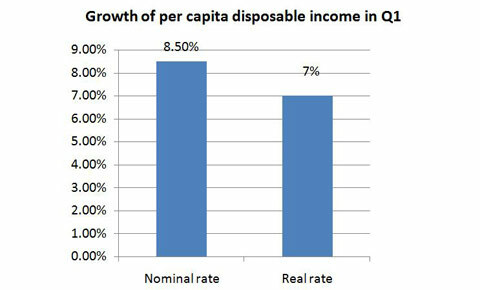 Per capita nominal disposable income of Chinese nationwide rose 8.5 percent in the first three months from a year ago, and per capita real disposable income after taking into consideration the effects of inflation increased 7 percent, outpacing the GDP growth rate of 6.9 percent in the period, NBS figures showed. Breakdown figures showed that urban residents' per capita real disposable income grew 6.3 percent year-on-year in the first quarter to 9,986 yuan ($1,452), while per capita disposable income of rural residents rose at a faster pace of 7.2 percent in the period to 3,880 yuan. China created 3.34 million new jobs in the first quarter of the year, said Mao Shengyong, spokesperson for the National Bureau of Statistics, at a news conference on April 17. "The figure was 160,000 higher than the number created in the same period last year," he said. China aims to create more than 11 million jobs this year, one million more than last year's target, according to this year's Government Work Report. China's economy grew 6.9 percent in the first quarter of 2017, government data showed Monday, beating expectations in the latest sign of stabilization for the world's second-largest economy. It was better than the median analyst expectation of 6.8 percent in an AFP poll, and also up on the fourth quarter figure. Gross domestic product increased 6.9 percent in the first quarter from a year earlier, compared with a 6.8 percent median estimate in a Bloomberg survey. It was the first back-to-back acceleration in seven years. The expansion further cements a rebound as producer prices surge, industrial output picks up and soaring credit fuels investment. China's economic recovery is gaining traction, with growth rising to its fastest pace in over a year in January-March. Analysts said government spending and a property boom spurred by easy credit were the main factors helping to driving stronger demand. China's economic growth in the first quarter rebounded to the highest level since the autumn of 2015, thanks to strong credit -expansion and government-led spending, with monthly steel -output hitting an all-time high last month. Gross domestic product grew 6.9% from a year earlier, according to official data published Monday, hitting its fastest pace since the third quarter of 2015. It's an uptick from the 6.8% recorded in the fourth quarter of last year - and slightly above what some economists had been predicting. The growth rate, which compares expansion with the same three months in the previous year, was slightly higher than many economists had forecast. State-led infrastructure spending and demand for new property helped drive the world's second-largest economy. The page is best viewed using IE version 8 or above, and other browers including chrome and baidu. Copyright 1995 - 2017 . All rights reserved. The content (including but not limited to text, photo, multimedia information, etc) published in this site belongs to China Daily Information Co (CDIC). Without written authorization from CDIC, such content shall not be republished or used in any form.